I have been waiting all year to post this cocktail because I wanted to do so at an appropriate time. I was going to wait until the Wright brothers' anniversary of flight at Kitty Hawk, NC but that won't be until December. Thankfully, in 1939, Franklin Delano Roosevelt established August 19th (Orville Wright's birthday) as National Aviation Day. You are all encouraged to observe the day with activities related to aviation, or in this case, the Aviation. 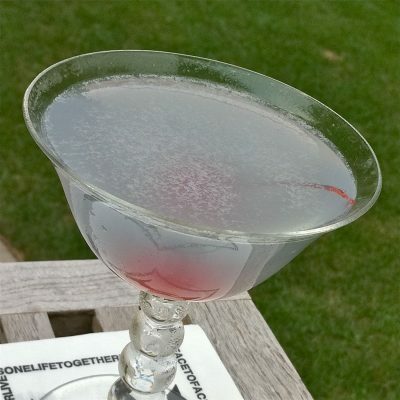 I doubt FDR's intent was to promote an interest in cocktails, but it's a very good excuse to post the Aviation as the Drink of the Week. To a cocktail enthusiast, every classic is important because of what it represents in the world of mixology. Whether it's a brilliant use of spirits or a unique and successful pairing of ingredients; classics are often foundational. Recipes evolve, but many of them stand the test of time. The Aviation first appeared in 1916 in the book Recipes For Mixed Drinks by Hugo Ensslin. 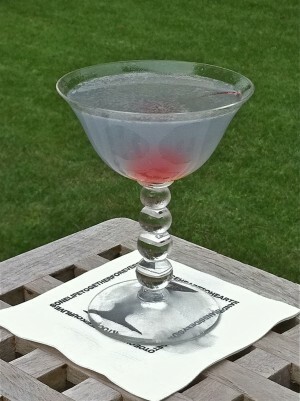 Fourteen years later, Harry Craddock dropped the difficult-to-find violet liqueur from the recipe in his Savoy Cocktail Book. It has survived both ways because it is a delicious showcase for maraschino liqueur—with or without the crème de violette. If you haven't had the pleasure, you really owe it to yourself to try this fantastic cocktail. It's my wife's personal favorite which keeps it in regular rotation at our house. Add all ingredients to a shaker, fill with ice and shake until cold. Strain into a chilled cocktail glass. Garnish with a cherry. Surprise, surprise—another classic gin cocktail. Actually, this is one of those moments when I need to convince you that gin in a cocktail like this does amazing things that you would not expect. There's chemistry (or magic) happening here. 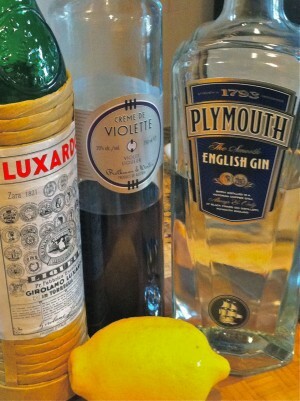 For this drink, I like to start with Plymouth gin. Plymouth is both a brand and a style of gin. Though certainly not a sweet, Old Tom style, it's definitely not a London Dry, either. It probably lands somewhere in the middle, with a light, smooth flavor that emphasizes the citrus character of its seven botanicals. While juniper is a requirement for all gin, it's not as prominent in Plymouth. In addition to gin, we have a balance of sweet and sour with fresh lemon juice against the maraschino liqueur. I use Luxardo, but there are other brands becoming available now. Maraschino liqueur is made from cherry pits giving it a unique, pungent funkiness that tastes as much like nuts as it does like fresh cherries. It's potent and wonderful in a cocktail, and the Aviation is the perfect delivery. Finally, we have the Crème de Violette. It all but disappeared for decades which prompted many to drop this ingredient from the recipe. Eventually, it has started coming back, and one of the first brands to appear on the shelves in the US was Rothman & Winter. Some people feel that its flavor is too sweet and opt to leave it out, despite its availability. Another brand, Crème Yvette, a spirit thought lost to the golden age of cocktails, has been resurrected by Cooper Spirits International. There are other brands you might be able to track down from Europe, but one thing is certain—you won't get that pale blue hue without a little violet liqueur in your Aviation. There's also just a hint of violets on the nose. The tiny portion isn't supposed to hit you over the head with floral notes. It's there to add a subtle suggestion of its presence and to contribute that kiss of color. Without it, your drink will be light gray and probably won't make you think of the wild blue yonder. Still, if all you can get your hands on is the maraschino, don't touch-and-go without trying an Aviation! Just purchased the last bottle of rothman and winter to make this tasty libation! Thanks! It's one of the best, and the version with violette is definitely worth it! The crème de violette gives this cocktail the prettiest color. This is still my gf's favorite drink. I now make it with Aviation American Gin from House Spirits in Portland. Highly recommend grabbing a bottle! It's still historically accurate to omit the violette but I always includ it. I love the color and the wonderful but subtle flavor/aroma at these proportions. This cocktail is very good with Aviation gin. It's a modern style gin with a flavor somewhat akin to Plymouth.